Dynamic computer simulations of molecular systems depend on finite time steps, but these introduce apparent extra work that pushes the molecules around. Using models of water molecules in a box, researchers have learned to separate this "shadow work" from the protocol work explicitly modeled in the simulations. 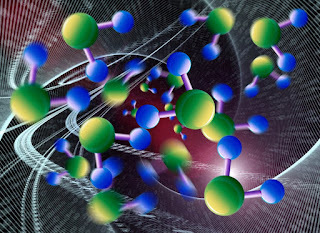 Scientists have devised a way using nonequilibrium statistical mechanics to study molecular simulations without the accompanying errors in data gathering. Scientists look at nonequilibrium statistical mechanics to simulate molecular behavior in a much more natural way. Most models are always at flux. They are continuously in motion and changing. This method tries to interpret real world mechanics into a computer simulation. The smallest form of life is a single cell. The cell is made up of molecules. Science tries to understand how these molecules interact with each other through microscopes. Microscopes have limitations on the size of the objects it can observe. On a molecular level where microscopes cannot clearly observe, science looks at computer simulations. A computational microscope doesn't use lenses or glass, it uses a computer to simulate molecules and how they act and interact. An example would be a simulation on how a virus enters and infects a healthy host. By studying its interactions on a simulation, scientists can understand its mechanics. At the heart of a computer simulation is its algorithm. It is a series of instructions on how a particular model or any of the model's components would behave given a particular scenario. There are many factors to take into account when creating an algorithm that would simulate the behavior of a molecule. Some factors to consider are the temperature, environment, time (duration), amount of light, and motion and direction of the molecule. Scientists are continuously striving to perfect these simulations which will benefit fields of science such as physics, quantum mechanics, medicine, and biology. Algorithms are precise. Given a specific situation, the algorithm will instruct the simulation to behave in a particular way. Real world scenarios aren't that "clean" or clear-cut, arbitrary factors not included in the algorithm may get in the way and produce a completely different result. But what is nonequilibrium statistical mechanics? This is a method on determining the behavior of models (or in this case, molecules) that are not in equilibrium. Equilibrium is defined here as a model that is in a state of balance or does not change. Natural systems are mostly non-equilibrium because of many underlying factors. Changes to the model may also come in different forms such as chemical, thermal, radiative, and mechanical (physical) change. Non-equilibrium statistical mechanics tries to take in all the factors and resulting changes to the model into account when constructing a simulation. Because of the large number of factors and changes that are calculated, computational errors are most likely to occur.